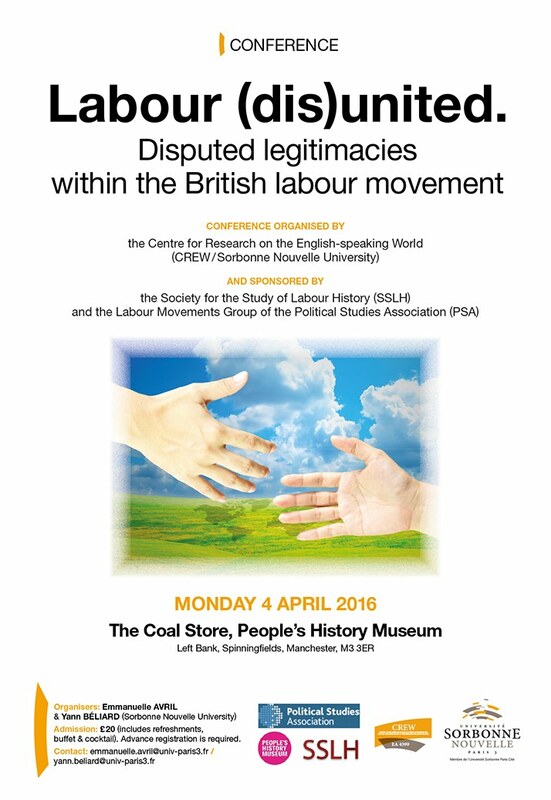 The conference, organised by the Centre for Research on the English-speaking World (CREW, Sorbonne Nouvelle - Paris 3 University), is sponsored by the Society for the Study of Labour History (SSLH) and the Labour Movements Group of the Political Studies Association (PSA). This conference brings together historical and contemporary perspectives on the study of the British labour movement, from the point of view of the tensions that have, time and again, challenged it, if not fractured it, from the inside. The study of labour organisations as such has sometimes been criticised as too institutional. Yet the organisers of the conference believe that the turn towards a ‘new labour history’ in the 1960s-1970s and a ‘global labour history’ since the 2000s, far from making the study of organisations outdated, has continuously generated, and will continue to generate, innovative research on ‘old’ topics such as: the Labour Party, the CPGB, trade unions, the Co-operative movement, friendly societies, etc. The focus on internal dissensions seems a particularly enticing avenue of investigation, precluding any celebration of a linear and consensual “forward march of Labour”. Conflicts of legitimacy within the labour movement have repeatedly raised the issue of who can claim to speak on behalf of labour organisations and working-class people. This conference will allow us to identify more clearly and from new perspectives long-term convergences and divergences in terms of both organisational structures and decision-making processes. Jeremy Corbyn and the politics of dominance: how do the two projects compare? Admission: £20 (includes refreshments, buffet & cocktail). Advance registration is required (contact the organisers).